SSD drives are nothing new. ( relatively speaking ). They have been around for at least 4 years, although 4 years ago they practically cost their weight in gold, and were more of something the ultra rich nerds would buy just for the bragging rights. Don't get me wrong the performance was there, but just like the first automobiles the first generation of SSD drives had their share of issues. In the blog I am going to try to explain the benefits of SSD drives and why you should or should not consider them. What determines the speed of a hard drive? Latency is the time it takes for a storage device to react to your request to retrieve a file. On traditional hard drives this was ultimately limited by the mechanical movement of the control arm. In the early 80s latency times were 80-100 ms. This was due to the fact that early hard drives control arms were powered by stepper motors. In the late 80s hard drives were made with voice coil type actuation which reduced the latency times to about 20ms. Then through the 90s and into the 00s improvements were made, getting this time down to <2ms for industrial high performance systems, but consumer grade devices still average around 9ms. Now if all your data is in a linear path, then latency will have little impact on your performance, as the control arm won't have to move around from sector to sector. But as hard drives are used, files become fragmented and the control arm has to move around much more to retrieve your data. This is why its recommended you run defrag to keep your computer running at maximum performance. If your data is in a straight line, then its like a drag race. The faster you can spin your platter the faster you can read your data. For this reason drives today fall into the 7200RPM, and 10000RPM range. Server grade SAS drives can also go up to 15000 RPM. Some drives on a linear read can achieve 150 MB/sec transfers. But in the real world we never get to do linear read and writes. Our computer is constantly reading and writing small files under 100K in size. Fragile: Drop it on the floor and it may break. Noisy: Anything that spins or moves makes noise. With laptops its obvious, SSD would mean longer battery life, but with desktops and workstations, which are often left running 24/7 the power savings could mean lower utility bills. The following charts are based on systems running 24/7. 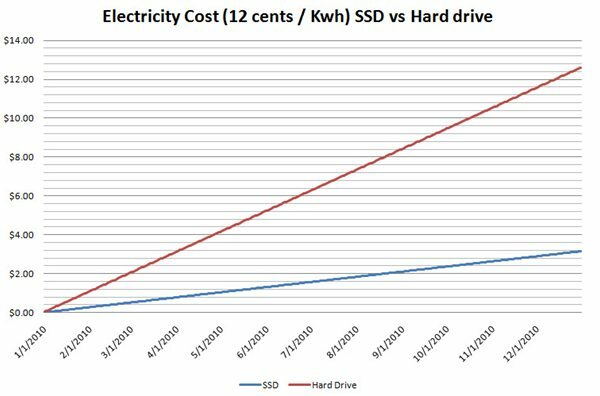 After 1 year of 24/7 use a regular hard drive would cost you about $10 more than an SSD hard drive. This was based on a 12 cents / KWH electric rate ( Houston Texas ). Also keep in mind I used a 3 watts consumption rate for SSD and 12 watts consumption rate for Hard Drive. Actual figures will vary based on the brand and model of drive you are running. These figures also do not take into account the cost of keeping your drives cool. My 4 x 15K SAS drives make enough heat to keep my office warm in the winter.